While recycling and reusing materials is important, the most beneficial thing you can do to make an impact is to minimize the amount of waste that you produce in the first place, including wasted food. You can refuse to accept things like single-use plastics--such as bags, bottled water, utensils, straws and coffee cups. Bring your own cloth bags, produce bags, sporks, water bottles and reusable cups or mugs. Puchase items with the least amount of packaging. This is the best way to guarantee that your stuff isn't headed toward the trash. Food waste is a social, economic, and environmental problem. As of 2017, 11.8% of U.S. households were reportedly food insecure. With the amount of nutritional food that is sent to the landfill everyday, this percentage should be close to zero. The annual estimated cost for the amount of food U.S. households throw away is over $160 billion. This is often due to people throwing away food that is past the "best by" date, even when the product is still safe to eat. Lastly, the environmental impact of throwing so much food away is tremendous. When food ends up in the landfill, it produces a lot of methane due to the slow decomposition process that occurs in the confined space of a landfill. Methane is a very potent greenhouse gas that contributes to warming within the atmosphere. Another environmental impact from food waste is the amount of water that is wasted from growing food that is eventually thrown away. On average, about 4.2 trillion gallons of water is wasted by Americans each year due to this. The best thing you can do in preventing food waste is to make sure all the food you purchase is utilized. If a product is past its expiration date, check the food before throwing it away. Alternatively, start a composting system at your home or utilize a composting service in your area so any food scraps you produce are used to create fertile soil. Go to our Compost page for more information about composting. 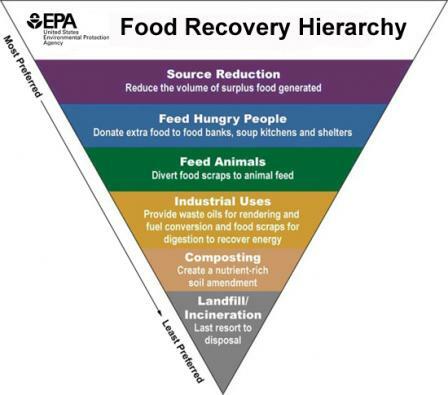 Another thing you can do is partake in the Environmental Protection Agency's (EPA) Food Recovery Challenge or check out their Food: Too Good to Waste Implementation Guide and Toolkit. Las Vegas Livestock (LVL) takes in Las Vegas' unwanted food and re-purposes it as feed for animals. The brothers, Clint and Hank Combs, started the farm in 2017 in Apex, NV. Their father pioneered food scrap feeding in Las Vegas in the 1960's, and now the brothers are modernizing this process in a new location. The motto of the farm is Humane and Sustainable. The LVL team provides excellent care to the animals, and the barns have been designed to keep the animals quality of life in mind. Sustainability is always a priority of the farm. The family has close ties to the desert and understand the importance in conserving resources as well as keeping food out of the landfill. Zero waste is a lifestyle choice that focuses on minimizing the amount of waste that is sent to the landfill. The primary goal is to reduce as much trash as possible, reuse items, recycle what does need to be thrown away, and composting the rest. Instead of discarding the resources used to create these products, the goal is to use these products as much as possible and recognizing the value in the non-renewable resources used to make products consisting of things like plastic, aluminum, and glass. Going zero waste doesn't mean throwing away everything you own and replacing it with more sustainable products. Use what you have, and then start looking for easy ways to begin reducing the amount of trash you create. Some places to start are replacing those plastic/paper shopping bags with reusable canvas bags, getting a reusable water bottle, using glass containers for food leftovers and packing for lunches, and bringing your own cup when getting your morning coffee (some places even offer discounts for customers who bring in their reusable travel mugs!). Small changes like these can make a huge difference. There are lots of online resources that can help you make the transition to a zero waste lifestyle. For a bulk store locator, check out Zero Waste Home to find grocery stores that sell items in bulk in your neighborhood.